The idea for this recipe popped in my head while on a girl’s trip to San Francisco with my friends from The Recipe Critic and Diethood. I rushed to make it as soon as I got home because I knew this would be a recipe to drool over. And it did not disappoint! This is the kind of chicken dish I could eat night after night after night. 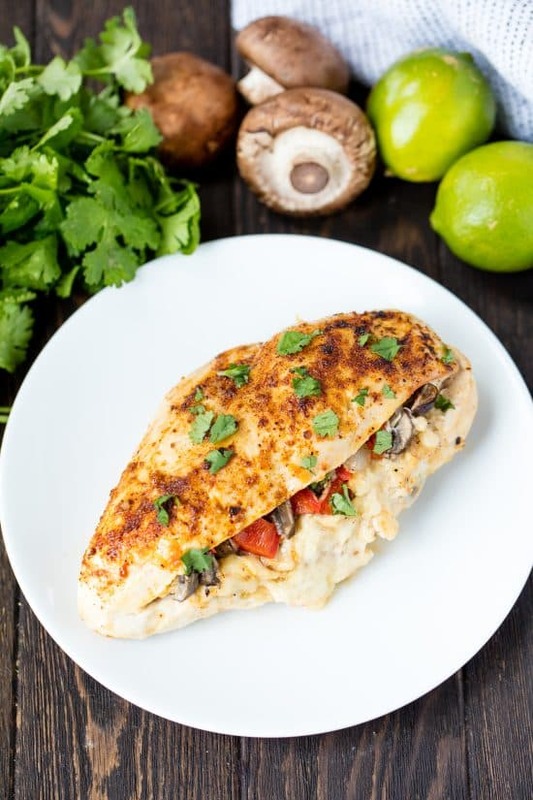 You can keep this dish low carb by serving it up with a salad, or serve it over some buttered noodles for a cheesy, saucy, carb overload. I won’t judge you either way. It’s so easy and so good, it makes the perfect weeknight dinner. And oh that cheese! I’m a huge fan. If you like this recipe, you may also be interested in my recipe for The Most Amazing Lasagna. 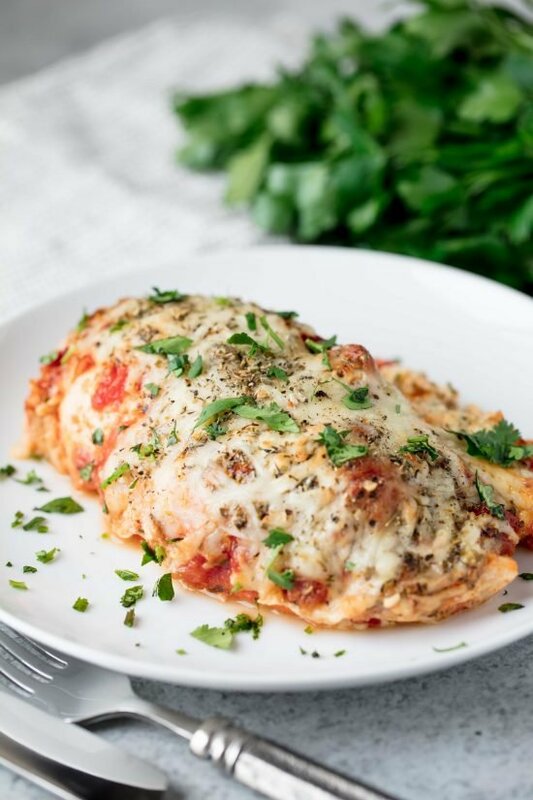 It is seriously the world’s best lasagna! Watch the video below where I walk you through every step of this recipe, including how to butterfly chicken. I have a whole YouTube Channel with my own cooking show where I let you join me in the kitchen. You should check it out! Spoon about 1/4 cup of sauce onto one half of each chicken breast. 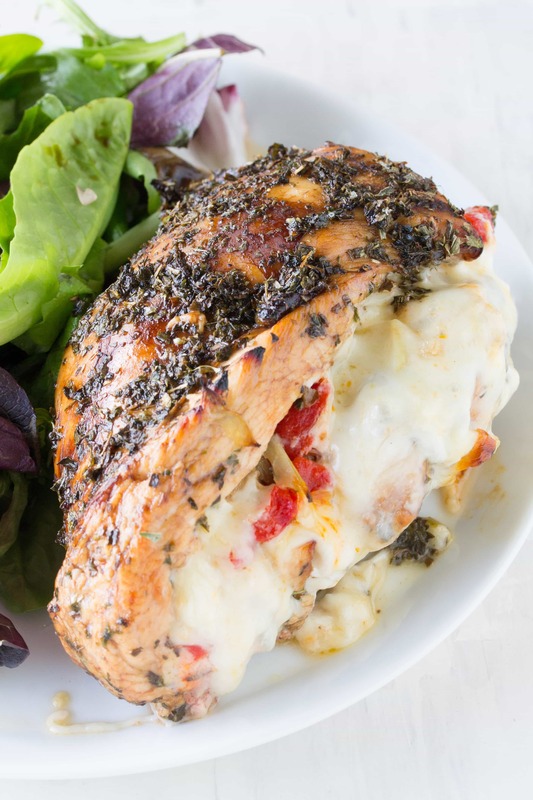 Spread ricotta mixture on top of the sauce and fold chicken breasts over to close. I found this to be excellent! And it is even keto friendly. I had leftover filling so I’m probably goo f to add it to some pasta for another meal. Oh and FYI I accidentally used 3 tablespoons of Italian seasoning instead of teaspoons and it was great. If made again, I wouldn’t change it. Made this on a cold, winter’s night and boy did it not disappoint. It was warm, cheesy, flavourful and comforting. Didn’t change a thing (except doubled the recipe for 4 chicken breasts). Will make this again! Easy. Will definitely make again! I have never tried anything like this before, because I have always thought it would be too complicated. Boy was I wrong. It turned out perfect. I loved it. Even my children loved it, and they hardly ever love anything. I will definitely be preparing this entree again soon. 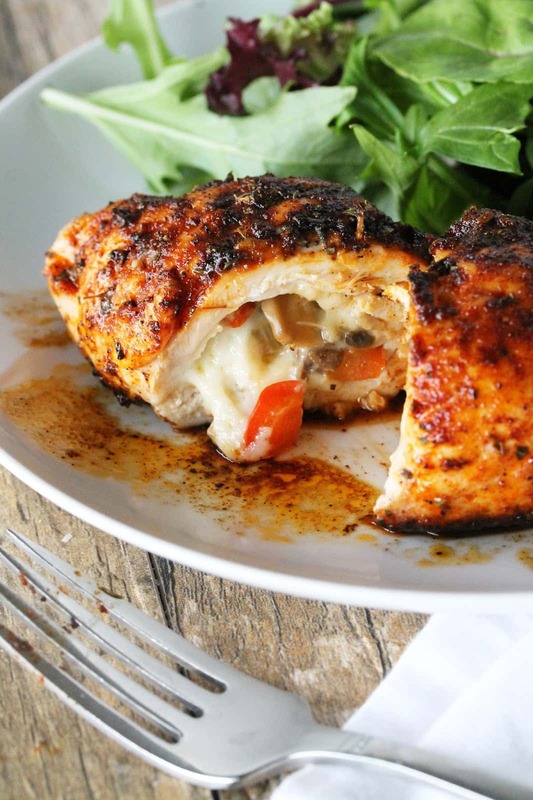 Best and easiest chicken recipe I’ve ever made! I actually received compliments on how good this was from the two guys I live with and cook for – that never happens – lol. Thank you so much for sharing. I will be making this dish on a regular basis for sure. 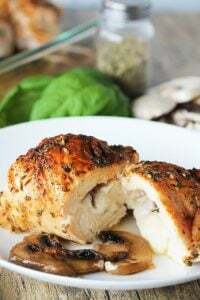 Chicken thighs as a replacement for breasts? I find they have more flavor so prefer to use them. You can, but thighs are a bit harder to stuff. 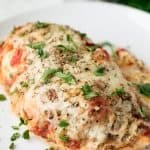 I am making a variation of this tonight: I have some leftover stuffed shells filing and I am going to use that! I think this will be a very good tasting meal! This was delicious! I also experienced an issue with the filling oozing out. I did fasten the ends with a toothpick. I think I will try to hammer the butterflied breasts next time and perhaps roll and bake them with the seam side down. Anyway, thank you for sharing this recipe!! SO YUMMY!!!! Parboil lasagna noodles just enough to be flexible. Wrap them around the stuffed raw chicken and then place the remaining marinara on top and cook according to the recipe. 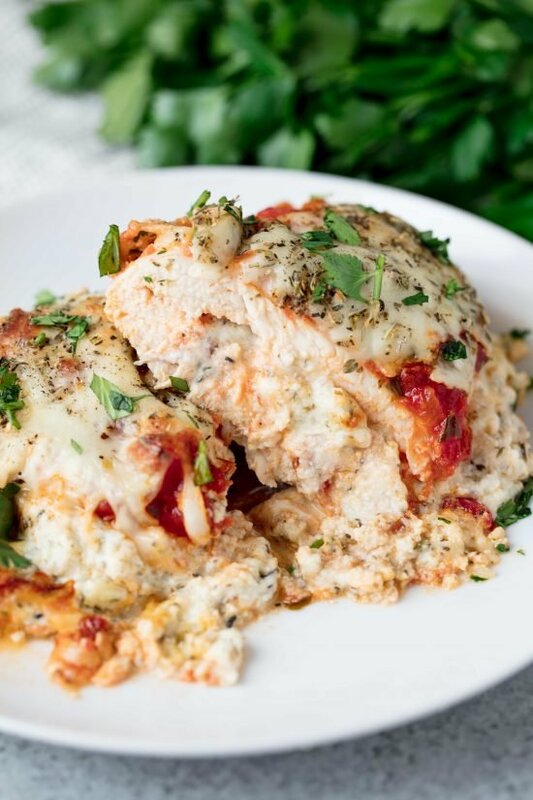 You can add some additional mozzarella on top about 10 min before chicken is done just to melt over. Noodles will finish cooking in the sauce and filling will be less likely to spill out. Plus it’s super yummy!